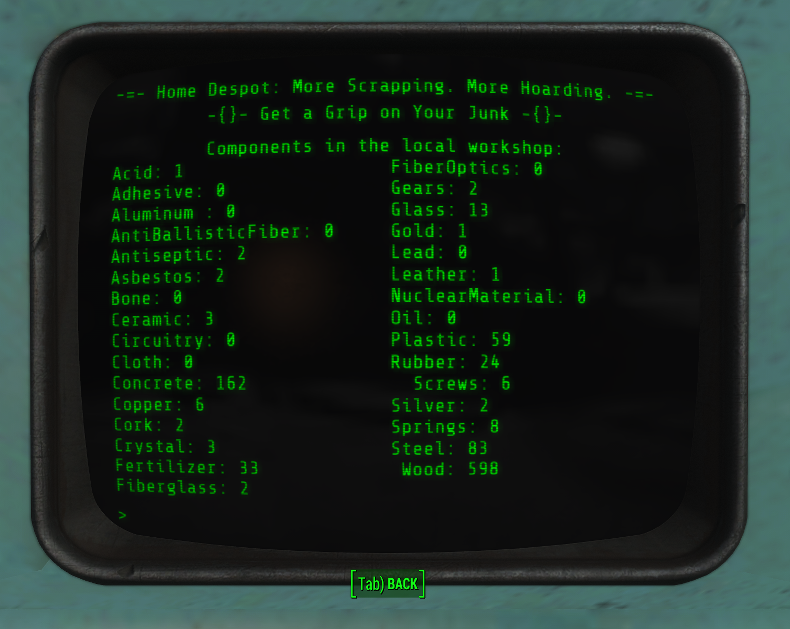 Ever wish you could see how many components you had available, without opening the Workshop menu and selecting random things to build to see what's in your workbench? 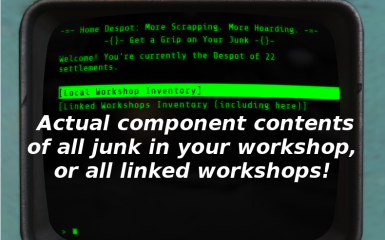 This shows the component values - not the junk pieces - from either you local workshop, or available from all linked workshops. Found really stupid errors in how I handled initializing the workshop arrays, leading to them breaking entirely. This is why Linked broke, but Local still worked. Welcome to The Home Despot! 3.0 is completely re-written, and better tested. Please see the sticky post if updating an old version. This mod adds a constructed terminal to the Power > Misc menu (near the "normal" settlement terminal). Place it anywhere in your settlement. not the junk items, the totals of the actual components they all break down to! Previously, the only way to find out "I wonder how many gears I have now" would be to open the Workshop menu, and try to build something requiring the component you care about, and no way to tell what's local and what's from a link. Q. The main screen says I have more settlements than I see on my map! A. This will only happen if you're using a mod-added workshop location that is already tagged as owned by the player (even if you haven't revealed it on your map yet). There's no way around this, if it's tagged as owned then it's owned. All issues should now be resolved. 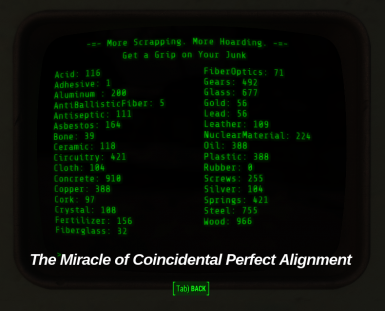 No more zeroed-out weirdness, or failing intermittently, or not counting certain settlements randomly. Linked function really does add local container contents to totals as advertised. Losing the original source was the best thing to happen to this mod, it was a mess. Completely reworked now.